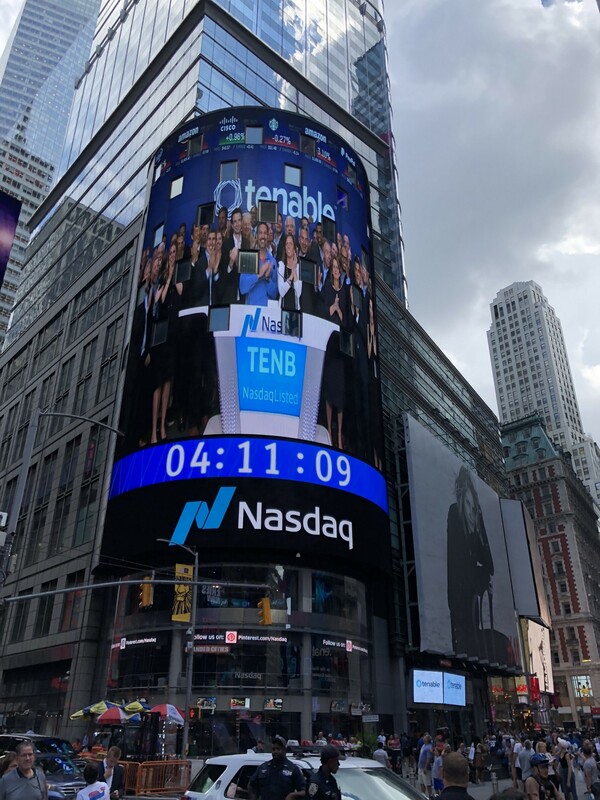 First published on July 26, 2018 Congratulations, team Tenable, on today’s IPO, a moment 16 years in the making. We’ve been fortunate to work with Tenable for the last six years of this journey, having led the first outside investment in the company ($50 million Series A in 2012). Before we got involved, for its first decade, Tenable never took any outside capital and was profitable. Back in 2012, we joked with the team that “Tenable was the best cybersecurity business that nobody had ever heard of.” While that dynamic is changing — especially within cybersecurity circles — today’s milestone allows us to shine a light on the values of this unique company, a company that has historically avoided the spotlight. When we first began meeting with Tenable in Columbia, Maryland in 2009, we were struck by the depth of cybersecurity talent at the company. Back then, the team bios read like a who's-who in security: the creator of the first intrusion detection systems / intrusion prevention systems, the architect of the firewall, and the inventor of the most widely deployed vulnerability management solution (Nessus) all worked at the (then) sub-100-person company. Maybe more importantly, even though these founders — Ron Gula, Jack Huffard, and Renaud Deraison — had a unique pedigree and a profitable business without raising outside capital, they were the first to admit what they didn’t know. They aspired to establish Tenable as not just a Baltimore-based cybersecurity company, but a global, category-defining cybersecurity company. To accomplish this, they were hungry to add talent that had scaled global technology companies. Fast forward to today and, over the decade since, we’ve worked closely with Ron, Jack and Renaud to build a very strong team in cybersecurity, including adding Amit Yoran as CEO (former President of RSA); Dave Cole as Head of Product (former head of product at CrowdStrike); Jennifer Johnson as CMO (former CMO Tanium); John Negron as head of sales (former head of sales, Sourcefire); and Steve Vintz as CFO (former CFO of Vocus). Part of the reason all these folks joined was the thriving business and “go-big” vision at Tenable. But a large part was also the founders’ humbleness around sharing the reigns and their desire to set the new team up to be successful. We’re proud to see all these folks together today, which is a testament to how a great founding team and humbleness around getting better can be a potent combination. Tenable has also always distinguished itself from its peers through its relentless focus on building great products. The company started out as an open-source project, Nessus, one of the most widely deployed vulnerability assessment solutions in the cybersecurity industry. Nessus has become such a standard that it’s seen approximately 2 million cumulative unique downloads globally since 2007. Over the years, Tenable has smartly added to its product portfolio, extending its vulnerability solutions in numerous ways. Through each addition, the company has prioritized listening to its extensive community (which now includes over 24,000 blue-chip enterprises including Amazon, DocuSign, FedEx, PayPal, and Starbucks) to inform its roadmap. In this way, Tenable’s approach is simple but very rare in today’s cybersecurity world: Build great products, delight customers, foster community, don’t burn more than you make, repeat. When we first began meeting Tenable, this approach reminded us of another Accel company with similar values that is also based outside the Bay Area — Atlassian. 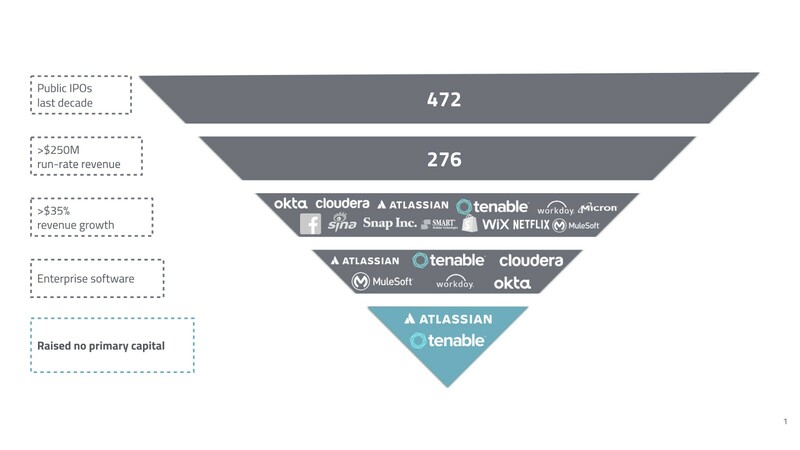 Indeed, only two software companies have gone public in the last decade with following traits: over $250 million in run-rate revenue, 35%+ revenue growth, and no primary capital ever raised: Tenable and Atlassian. There’s a lot of debate in today’s SaaS market about growth versus profitability trade-offs. Tenable has been able to achieve both, a truly rare quality; because of a relentless focus on product and customers and the team’s consistent execution. Cybersecurity has been an industry of core emphasis for Accel for the past 35 years. There have been many waves of cybersecurity innovation as hackers continue to identify new attack patterns and surfaces. This last decade has been the most dynamic era of cybersecurity and unfortunately, it appears security breaches are still on the rise. In order to lead breakthrough investments in this rapidly evolving sector, we’ve had to continuously refine our investment focus and go deep into a given sector to better understand the market nuances and identify the most exciting entrepreneurs. That’s led us to the early investments in a number of breakout security leaders. In the case of Tenable — the company is the pioneer of the “cyber exposure” market, which we believe to be one of the most important security markets going forward. Tenable is the platform to answer this question. As IT environments become more complex, the modern enterprise attack surface now includes anything connected to the internet: laptops, tablets, phones, containers, etc. Tenable has moved incredibly quickly to build a platform designed to provide broad visibility and deep insights into cyber exposure to better manage IT assets and patch vulnerabilities in real-time. Tenable’s solutions also provide a set of benchmarking tools that allow security teams to show improvement and compare progress against peers. Taken together, these products provide boards and executives with the first way to objectively measure and contain cyber risk. We think Tenable is well-positioned as it starts to roll out these “cyber exposure” benchmarking applications. Today, a few more folks have heard of Tenable than in September 2012. But behind the scenes, this has always been a unique company with a core set of values that we encourage others to replicate: an accomplished, yet humble team that’s always willing to hire better; a compelling go-to-market model based on product and community; and a big opportunity to be a central player in an emerging category. So as we continue to look for the next great software and cybersecurity company, it means we’ll be looking for the next Tenable. Tenable team — congratulations again on all the energy and effort you’ve poured into the company to make today possible. Thank you for including us in your exciting journey. We feel lucky to have been your partners for the last six years and are looking forward to even bigger things ahead. Enjoy your well-deserved day, finally in the spotlight!